Salty capers and sour lemons. You know who you are. These are appealing flavors, and the thinned, browned chicken is a crowd pleaser. 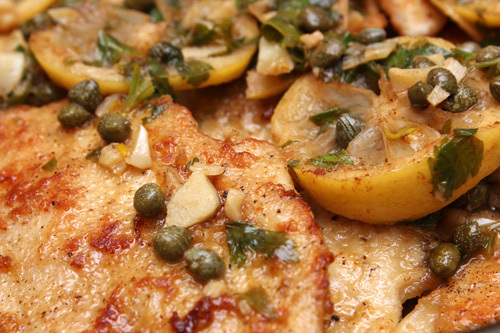 The “Chicken Piccata,” from the November 2013 issue of Every Day with Rachael Ray, did exactly what I’d hoped it would do, without much fuss, really. This recipe includes tips that make perfect sense. The “warm plate in the oven” trick is easy and it works, to keep your browned chicken warm while you make the sauce. As for “pounding the chicken” here’s what I did: slice the chicken breasts as thin as you can, laterally, with a serrated knife. Place a slice of this chicken between sheets of parchment paper on your counter top, then slam it with your rolling pin for a few hits. This will give you your pounded slices of thin chicken (while allowing you to vent your frustrations). Simple, right? A bit of patience is necessary, here. Make sure to allow your chicken slices to brown in the pan of olive oil. Don’t rush it. Everyone will love the final lemony, garlicky, thin chicken. And speaking of garlic…chop extra to make some garlic bread with this meal. Since I’m in chicken mode, next time I will tackle the “Best Chicken Stew,” from the November/December 2013 issue of Cook’s Illustrated (recipe below). No pressure there! Come back to my site next week, to see what happens. 3. Add onion, celery, garlic, anchovy paste, and thyme to fat in pot; cook, stirring occasionally, until dark fond forms on pan bottom, 2 to 4 minutes. Increase heat to high; stir in 3/4 cup broth, wine, and soy sauce, scraping up any browned bits; and bring to boil. Cook, stirring occasionally, until liquid evaporates and vegetables begin to sizzle again, 12 to 15 minutes. Add butter and stir to melt; sprinkle flour over vegetables and stir to combine. Gradually whisk in remaining 3 cups broth until smooth. Stir in wings and bacon, potatoes, and carrots; bring to simmer. Transfer to oven and cook, uncovered, for 30 minutes, stirring once halfway through cooking. 5. Discard wings and season stew with up to 1 1/2 Tbsp. extra wine. Season with salt and pepper to taste, sprinkle with parsley, and serve.